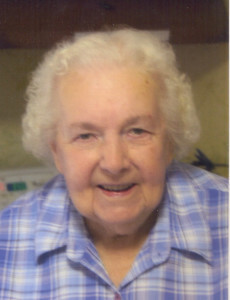 Dorothy ( Lindholm) Martensen was born on July 17, 1923, at Dallas, South Dakota, to Carl Victor and Ida (Iburg) Lindholm. She passed away peacefully at the Winner Regional Healthcare Center on March 20, 2015. When the family relocated from Dallas, South Dakota, to Galva, Illinois, Dorothy attended schools there. Several summers she and her family made trips back to South Dakota to visit relatives. Inspired by these trips, Dorothy (as a teenager) decided to take the trail west to South Dakota. She continued her education in the world of work. She worked at her aunt’s turkey farm, at the cold-pack plant in Winner and at other jobs. In 1942 Dorothy was united in marriage to Marvin Rose of Winner and together they engaged in farming. Four children were added to the family: Carl, Sandra, James, and Jack. In the late 1950’s Dorothy owned and operated the Hamill Cafe. The way she reminisced about her café business, one would soon realize how much she truly enjoyed that experience of her life. Dorothy married Art Martensen in 1962 and later moved to his farm north of Winner and sold the Hamill Café. Her farmhouse was known in later years as the “neighborhood coffee shop” where the coffee was always on. Dorothy was a lifetime member of the Legion and VFW Auxiliary; and for many years she organized and held the VFW Senior Citizens Card Party. She loved to paint- embroider, cook, can fresh produce, and make jelly. Her chokecherry jelly was a favorite of many. Dorothy was a wonderful homemaker, a person of high values in hard times, and most importantly, a mother, grandmother, great-grandmother whose love for her family was steadfast and strong.